JVC DLA-Z1 review | What Hi-Fi? JVC is no stranger to producing class-leading projectors. The company has produced a stream of them over the years, and we’ve used a fair few as reference products in that time. Yet nothing we’ve seen from the company has been as ambitious as the 4K HDR DLA-Z1. While both those technologies are firmly imbedded in the world of televisions, the combination is still a relatively rare thing in the world of 'proper' home cinema. All the 4K projectors we’ve reviewed have been premium devices costing thousands, but even by those hefty standards the JVC is priced in a different league. It’s a cutting-edge uni, the like of which never comes cheap. The Z1 uses three 4096 x 2160 D-ILA panels with a light engine based on JVC’s proprietary BLU-Escent laser projection technology. It uses blue laser diodes to offer 3000 lumens of brightness and 20,000 hours of operational life. That’s well beyond the life of a typical projector bulb. D-ILA is a kind of hybrid of DLP and LCD technology, and JVC (along with Sony with its SXRD iteration) has been using it for years. Just as important as the projector technology is the lens system, and here JVC’s engineers have refused to compromise. The lens assembly is an 18-element affair with a 100mm diameter. It’s designed to reduce colour distortion to a minimum while maintaining transparency. As far as HDR goes, the Z1 can process the recently introduced Hybrid Log Gamma alongside the more established HDR10 standard. This JVC is a huge projector. It’s about the size of a suitcase and, at 38kg, weighs as much as a suitcase lined with lead. Yet it's relatively quiet, being rating at a low 25dB even with the fan running. Connections are simple. There are two HDMI inputs (HDCP 2.2 compliant), an RS-232 port and RJ45 connection (both for home integration). You would imagine a projector such as this would be difficult to set up, but it isn’t at all. Provided you can cope with the bulk and put it in a sensible position relative to the screen, the rest is straightforward. Motorised lens shift, zoom and focus makes positioning the image a breeze, while the clear menus make optimising it easy. However, we suspect few customers will actually install this monster themselves. At this level it makes sense to get the selling dealer to do it. They're almost certain to feel obliged. Once up and running, the JVC is an astonishing performer. We dive straight in with the brilliant Planet Earth II 4K Blu-ray by the BBC and love what we see. Bold, richly textured colours collide with the crispest edges and sharpest detail we’ve ever seen from a projector. This disc is beautifully shot, and the Z1 is more than talented enough to show it in its full glory. It handles the subtleties brilliantly, not only low levels details such as the texture of a humming bird’s wings or the nuances of a frog’s skin, but in the way it renders small changes in light. We can’t remember seeing a display that gives such an impression of depth via a 2D image – in large part that's down to the superb way it renders changes in shading. Contrast is rated at what is essentially a meaningless: Infinity:1. But there’s no denying contrast is superb, delivering bright and dark elements in a single frame brilliantly. By all but OLED TV standards, black levels are excellent too - they don’t sacrifice much in the way of shadow detail in the darker scenes in the process either. Moving to standard Blu-ray isn’t the letdown it could have been. The format’s lower innate resolution (compared to 4K) is obvious in the slight blurring of detail and lack of crispness, but the Z1 has a fine internal scaler that still makes the most of things. We watch Scott Pilgrim vs The World and like the way the projector copes with the rich colour palette, subtle details and fast motion. This is the kind of image that is good enough to transport us into the film, and never jars with shortcomings in format or resolution. It’s a stable and secure picture, keeping track of movement without obvious blurring or judder. If you want 3D, you’ll have to spend extra for the optional glasses and transmitter. However, when the outlay is so hefty anyway we suspect it wouldn’t be hard to get a dealer to chuck them into the deal. If your viewing habits take in large doses of standard definition source material, then the DLA-Z1’s talents are far less obvious. Watching Stoker on DVD we find it produces a relatively clean and crisp image, with a surprisingly low level of picture noise considering its native 4K resolution. Colours look convincing while motion is pretty surefooted too. 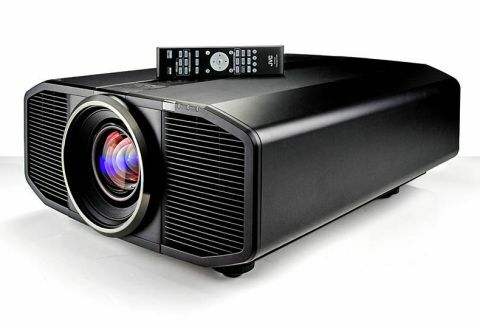 But overall, there are cheaper Full HD projectors that do as good a job with this format. Standard definition material will never provide a great platform for a top-end projector to show off its talents, but the JVC at least proves its all-round ability. Let’s imagine for moment the £35,000 price tag hanging off this JVC isn’t an issue. What your money buys is a projector that produces the finest images we’ve seen in our test rooms. Consider us tempted.